I have come to the conclusion that it is impossible to get sick of smoothies. They are too darn good. We would have them every weekday morning if we could drag ourselves out of bed early enough to actually EAT breakfast. We were so good for so long, and lately with all of the renovation we have been doing in all of our spare time, we are over-tired so rarely manage to get up early enough to eat at home. This means hitting the egg bacon and cheese muffin for breakfast from the work cafeteria way more often than I should admit. My waistline cannot lie though. Sigh. We miss our morning routine and are working on it. One of the strategies involves making things easier. Our nutrininja is great and makes the smoothest smoothies we have ever smoothed. We also recently bought a vertical deep freeze (lifelong dream of mine, yes I am that boring). A couple of weekends ago I filled two drawers with smoothie supplies…..I got some funny looks at the checkout I can tell you that! I found out that bananas keep for 6 months in the freezer. Given the large variability in banana prices over the course of the year where I live, as well as the fact that frozen bananas require no peeling and make for a creamier smoothie, I bought all of the ready-to-eat ones in the store. ALL of them. We took them home, peeled them, chopped them, put the pieces flat into freezer bags (with 5 bananas per bag to provide one week of smoothies per bag) and filled a drawer. Another drawer is now filled with various other frozen fruit when it was on special – pinapple chunks, rasberries, strawberries, blueberries, mixed berries, mangoes, cherries…you name it. Now each week we simply have to grab a bag of bananas and a bag of fruit from the deep freeze on Sundays, move it to the normal freezer for the week and its a breeze! Smoothies don’t even require ice if the other ingredients are already frozen! We even have frozen spinach in cube form! 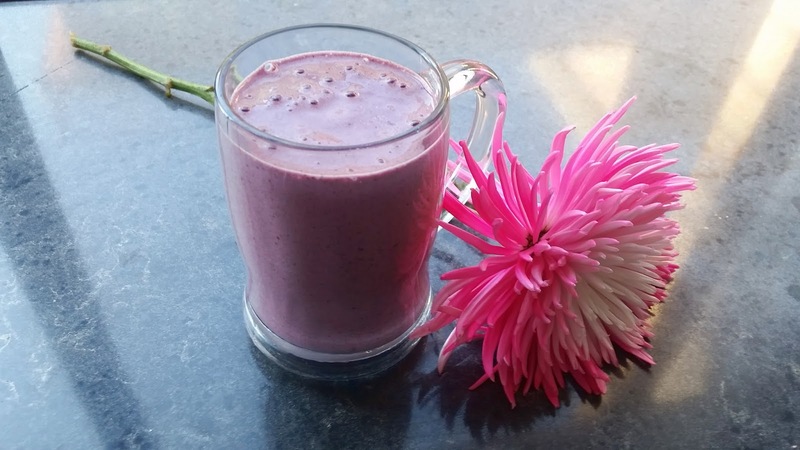 Now to actually get up in time…..
All of that aside, here is the delicious smoothie that I made for us both this morning. Simple and yummy. Pictured with one of the gorgeous flowers the Dragon got me – the colour is out of this world. 2 bananas, peeled and chopped. Frozen or fresh are both fine. I always feel weird writing a method for smoothies, but here goes. Rabbiting on … badum tish! hahaha 🙂 Yum! Your mango madness smoothie sounds delish! I will have to try it 🙂 Good idea with the batch making on Sundays and storing them in jars with lids…..makes it even easier…going to need to buy some appropriate jars and give that a go. I didn't realise you could get sick from too much spinach? I go pretty overboard with my spinach sometimes.